At NCF Church we have learned a great deal about MC’ing at our various meetings. 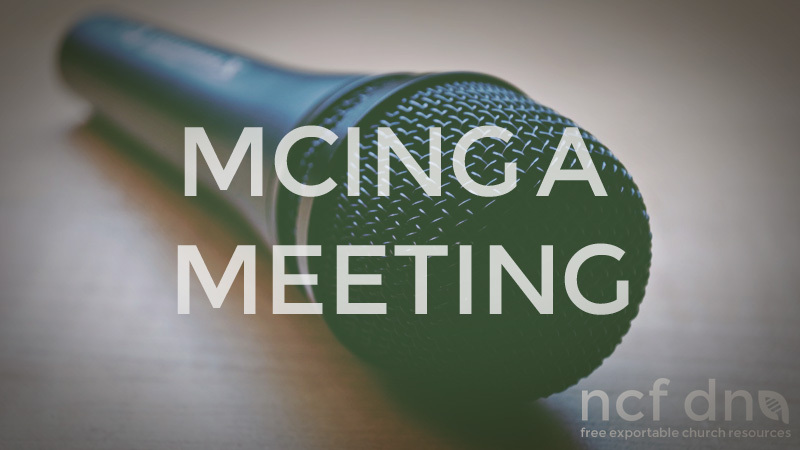 Here are some of our thoughts on MC’ing a meeting. Countdowns can help start big meetings. If you use a countdown for a small meeting, you probably need to use it to launch an “Hello”. But in any event, the first time someone takes that Mic they should be full of life, sincere, happy and welcoming. Some people just don’t do that naturally. I wish some speakers would practice in the mirror before they walked out on stage. Sometimes the best governors, leaders and preachers should be kept well away from the mic till the meeting is well and truly flying. A great way to get visitors to church. To do so you need to encourage people dedicating their kids to invite their family. If you battle to connect with a crowd emotionally, leave the dedication to someone who can speak with heart and sincerity. Don’t rush a dedication, it is a huge moment for the family. Also find a way to make it interesting for everyone else in the room. To know who the family is will help, to teach a little into parenting, or a prayer can help. Remember the unsaved family, use the opportunity to point to Jesus. Also, don’t impose the mic on a father or mother without asking them before the time. The early church broke bread regularly, but it was typically part of a broader meal which came very naturally. In our church service context, you want to remove the ‘weirdness’ factor, the religious factor and celebrate in a deep and meaningful way. You need to remember visitors and the unsaved will be sitting in your meetings. There are 2 main methods we have tried. Getting people out of their chairs around stations/tables. The value of this method is added involvement and the release of spontaneous expression. The dangers however are for the unchurched. They will either be terrified going up front, not knowing who is going to get them to stand in a circle and pray, or what to do with the bread. Or if they choose to stay in their seat they become conspicuous by their non-participation. The bigger we get, the more reluctant we are to get people out of their seats to create the spontaneous chaos that mature christians thrive in. Handing the trays down the rows. This method can get boring if you don’t lead strongly from the mic. It does lend itself to involving leaders to serve. In addition, the new people are handled in a more dignified manner. we have learnt that a private baptism (even though the Ethopian in Acts 8 seems to have had one) invariably is counter productive. The very purpose of baptism is a public demonstration. The benefits of the whole church witnessing it are enormous. In a big setting we get the cameras on the pool. It’s also a moment for people to invite unchurched friends and family to church. If you are going to get them to speak, rather ask: “How did you get saved?” or “How did you get to come to Church?”, rather than “Why are you getting baptised?” If you have the time, pause to pray over them, make it personal. Take photos and send them to those who got baptized. The spiritual focus needs to be on Jesus, not the people. If you bring each meeting around him, you can hardly go astray. The focus of attention, should be the front of the building. Side murals, open curtains to magnificent views and crying babies all serve to take the focus away from those directing people to Jesus. Meetings should be no longer than you have said they will be. The fastest way to kill an “invitational culture” is to make visitors endure meetings longer than they expected to. If you feel you need to lengthen a meeting in order to minister to people, you should have the courtesy to pause at the scheduled closing time and release those who need to go. The irritation and damage that you will cause to those who are ready to go will far outweigh the blessing you are to those who want to linger. A service shorter than 75 min is probably underdone, but a meeting longer than 100 minutes is going to tax a large number of people present. People born after 1996 have been dubbed “digital natives”. The use of media is essential to reaching them as it is their native language. It does not mean your whole meeting goes digital, it simply means that using some media is a point of common ground with them. We have found media useful in setting a mood. Music and imagery create mood very effectively. In big buildings, the use of cameras on the speaker is significant in that it brings the facial features into play. Videos are helpful in creating preaching platforms and vision announcements, but they should ideally be short and punchy, setting the stage for the preacher. The golden rule is worship with your eyes open. A chat between the Mc and music leader before the meeting is very helpful. Also, unless the music is really bad, resist the temptation to interrupt for the first 15 minutes. Prayer meetings before the service often bring faith and direction into the meeting. However, this meeting should never be held in any place remotely visible to visitors. There is very little as intimidating as arriving at a meeting where you don’t know what is going on. The meeting can’t be at fever pitch for 90 minutes. One needs to understand how to flow with the Spirit. Creating times of quiet, noise etc. If the guy with the Mic handles disturbances he will either look like a Bully or be sucked into a fight he shouldn’t be in. A support team should handle hecklers, babies etc. An ending should be definite; a big song, a heartfelt goodbye, a ministry moment which ends with the releasing of everyone else. The worst endings are those that limp over the line. We hope that this resource blesses you and the way you deal with mission and evangelism in your church. Feel free to print, edit and distribute this document.